The Brief: SBEVE is an abbreviation for "he lied" that comes from the phrase "(S)he (be)lie(ve)d."
(S)he (be)lie(ve)d is a style of quote, meme, or image macro that has circulated on sites like Tumblr and Instagram for years. Recently, the meme has spread to Reddit, specifically the Dank Memes subreddit, and other social media sites as a way to poke fun of its melodramatic tone. 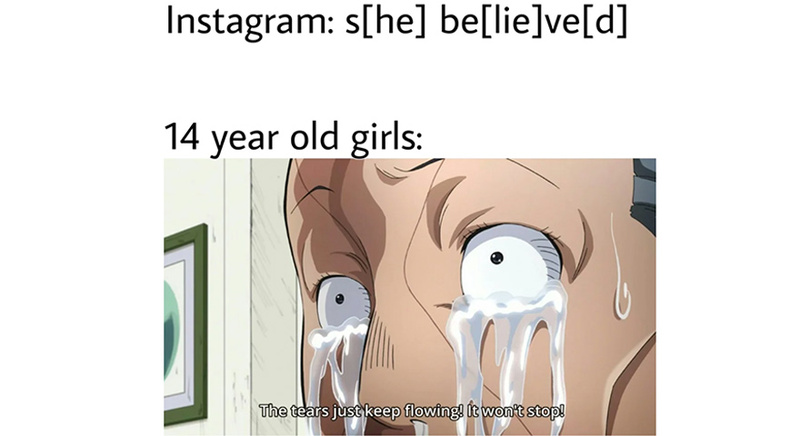 A common iteration of this meme shows the phrase (S)he (be)lie(ve)d and then depicts the emotional reaction of a teenage girl or someone else deeply affected by the contents of the phrase. That’s actually really deep tho. Other memes make fun of dramatic wordplay quotes similar in format and theme to (S)he (be)lie(ve)d.